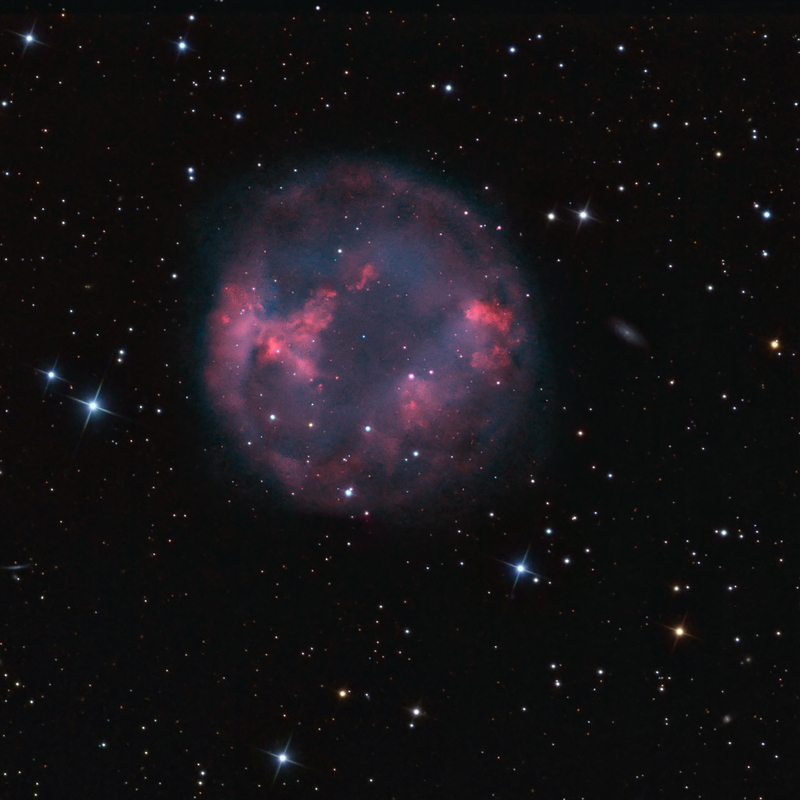 Abell 7 (PNG 215.5-30.8, PK 215-30.1) is a large, faint, ancient planetary nebula (PN) in the southern constellation of Lepus. According to Tweedy and Kwitter (Astron. J. Supp. Series, 107, 255-262, 1996) Abell 7 is the largest PN that is not interacting with the interstellar medium (ISM). Phillips (ibid, 139, 199-217, 2002) gives a distance of about 1,800 light years. In the deep image presented above, the field is 30′ x 30′ and north is toward the upper right. The long exposures show a slight elongation toward the upper left and lower right, making the size of the object in the image ~ 15′ x 13′. The central white dwarf star is designated as WD 0500-156. This star may be part of a binary pair (De Marco, et al., 2012) based upon a Hubble image showing a red dwarf companion 0.91″ away. Narrowband filters were used to enhance contrast and bring out the amazingly complex and beautiful structrure of Abell 7. The image was processed in “natural color” where Ha+[NII] was mapped to red/magenta and OIII was mapped to ~ blue = green. A 5 nm H-a filter was used to capture both hydrogen-alpha emission and nitrogen. Tweedy and Kwitter show this object to have a significant NII emission. The small galaxy to the right of Abell 7 is mag 15 PGC 16611. The tiny edge-on galaxy toward the lower left near the edge of the field is mag 15.2 IC400. It is difficult to put into proper perspective what I mean when I describe an object as “faint”, even if one has some familiarity with astrophotography. Please take into account that these objects are imaged from a 0.5 m telescope (large for amateur standards) that is also quite fast (f/6.7) vs. other large scopes designed for f/9 or f/10. 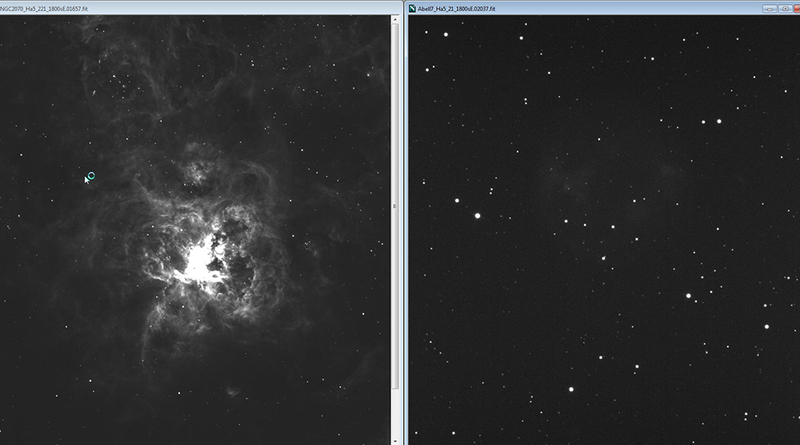 Toward this end, I’ve put together a side-by-side comparison of hydrogen-alpha images. On the left is a single, uncalibrated 30 min exposure of the “bright” central region of the Tarantula Nebula (NGC 2070) in the Large Magellanic Cloud. On the right is the same exposure for the “faint” Abell 7. Both images have been stretched to bring out as much detail as possible. The only other processing was the use of a 3x3 median Kernel filter in MaximDL to remove hot pixels. Even with a 30 min. exposure, Abell 7 is barely visible, so many exposures must be taken, processed and combined to bring out the richness and varied colors of these “faint” ojbects.